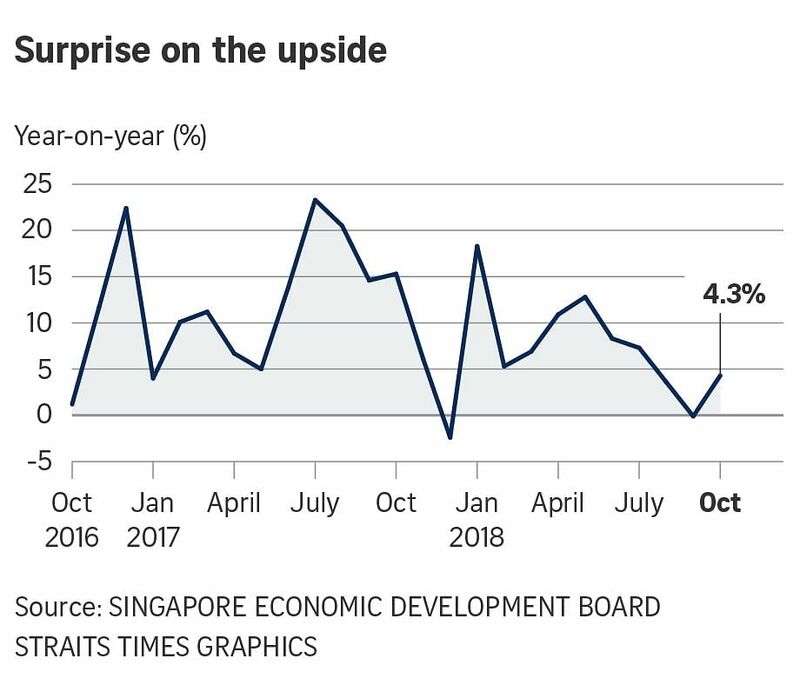 SINGAPORE - Singapore's manufacturing output grew 4.3 per cent year on year in October, more than rebounding from September's 0.1 per cent dip and exceeding economists' expectations of 2.6 per cent growth. Excluding the volatile biomedical manufacturing sector, output grew 3 per cent, preliminary estimates from the Economic Development Board on Monday (Nov 26) showed. On a seasonally adjusted month-on-month basis, October's manufacturing output also ended a three-month streak of decline, instead growing 2 per cent, or 3.9 per cent without biomedical manufacturing. On the downside, electronics output fell for the second straight month, down 2.7 per cent year on year, with semiconductors, computer peripherals and data storage seeing contraction. Other electronic modules and components grew 5.1 per cent, and infocomms and consumer electronics segments grew 1.7 per cent. Despite this, the electronics cluster's output has still seen a cumulative increase of 8.9 per cent from January to October, compared to the same period the year before. The only other cluster to see a contraction in output was chemicals, down 1 per cent year on year. Production in petroleum and petrochemicals fell 9.6 per cent and 14.7 per cent respectively due to maintenance shutdowns, while the other chemicals segment grew 15.1 per cent with higher output in fragrances. Transport engineering remained the top-performing cluster for the second straight month, with output up 30.8 per cent year on year and all segments recording growth. Marine and offshore engineering grew 52.2 per cent on the back of a low base a year ago, as well as more work done in offshore projects. Aerospace grew 15.6 per cent with more engine repair and maintenance work from commercial airlines. Biomedical manufacturing output grew 11.5 per cent in October, in contrast to September's 9.3 per cent contraction. Pharmaceuticals output expanded 15.8 per cent with higher production of pharmaceutical and biological products, while the medical technology segment grew 2.9 per cent to meet export demand from the United States. Precision engineering output grew 1.4 per cent, with the precision modules and components segment's growth of 7.7 per cent more than making up for a 2.9 per cent fall in the machinery and systems segment, due to lower production of industrial process control and semiconductor equipment. General manufacturing ended a three-month decline by growing 1.3 per cent. Although the printing segment remained in contraction, the miscellaneous industries segment grew 2.9 per cent with higher production in structural metal products and batteries, while the food, beverages and tobacco segment rose 2.1 per cent with higher output in infant milk and dairy products.